An elderly couple, their only son, the son's wife, a young man and his lover live peacefully in a small residential area. Then, a terrifying earthquake strikes that causes a nearby nuclear station to explode. The residents learn they must evacuate, but the elderly couple owns a farm, with the evacuation line draped across their front yard. The father wants to stay, but the son wants him to go. Meanwhile, the son's wife Izumi (Megumi Kagurazaka) learns she is pregnant. Filming began January 13, 2012 and production finishes April, 2012. 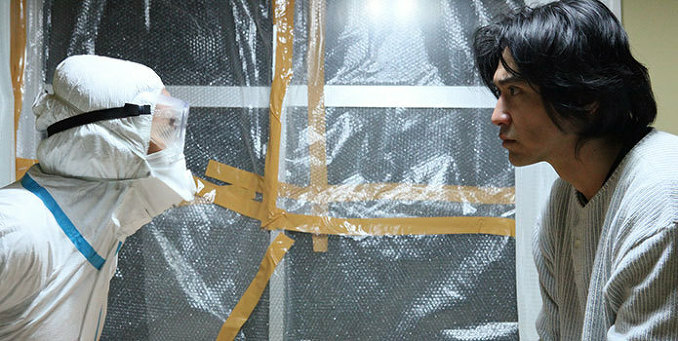 Movie is a co-production primarily between Bitters End and Sion Sono’s agency Dongyu Club. Other companies that are production partners include UK company Third Window Films, Japan’s Pictures Dept., Germany’s Rapid Eye Movies and Taiwan’s Joint Entertainment. Q&A for "The Land of Hope" with director Sion Sono took place at the 2012 Busan International Film Festival on October 5, 2012. AsianWiki editor Ki Mun was there and transcribed/translated the session. Sion Sono: Thank you for watching my movie. Moderator: Will Izumi successfully give birth to her child? Sion Sono: Of course. She will give birth to a healthy baby. Probably, Yoichi and Izumi will make a land of hope. Moderator: I think the shooting took place in Nagashima? I would like to know how Nagashima is now and the people there? 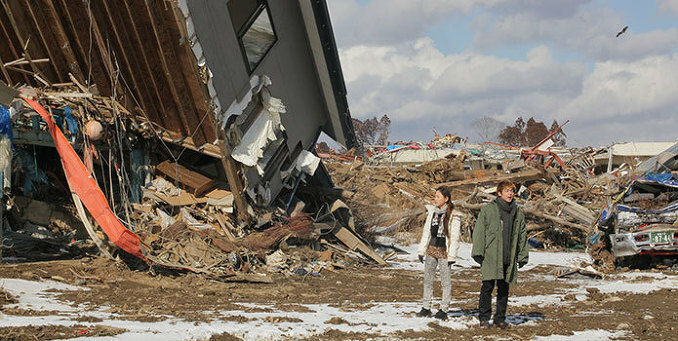 Sion Sono: The movie is based on a real life incident involving the Fukushima Daiichi nuclear disaster. The movie's setting though is fictional. I created the name of Nagashima. 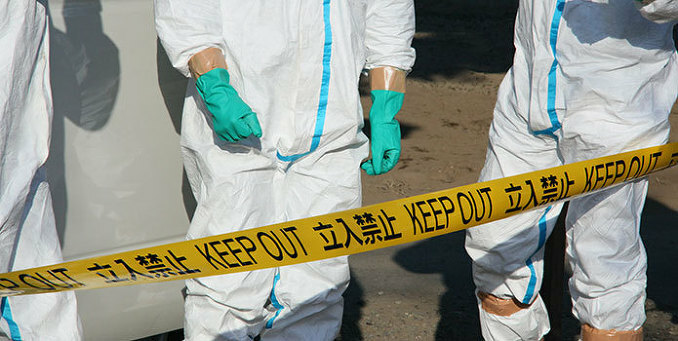 There are three cities in Japan which have been exposed to radiation: Nagasaki, Hiroshima and Fukushima. I mixed and combined those names to come up with Nagashima. 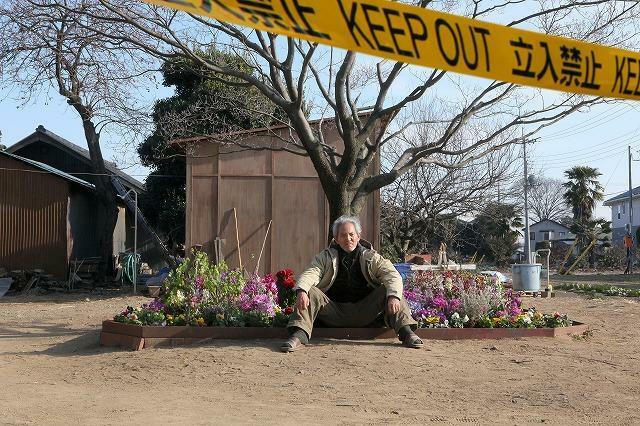 There are not many scenes shot in Fukushima itself. One of the main themes in the movie is that these kinds of incidents can happen anywhere. 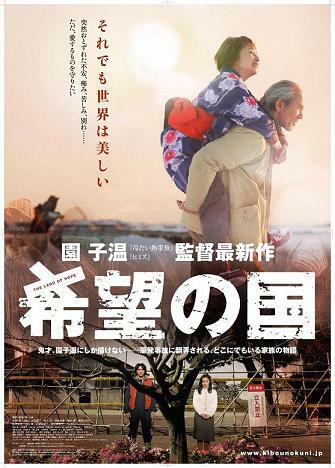 With that theme in mind, I shot the movie in several rural areas that resemble many other rural areas in Japan. Audience Question: You give out hope in your previous movies as well. The Japanese government declared that Japan would abandon nuclear power by 2030, but the Korean government has not made any timeline promises. Can you talk about the nuclear power matter from a North East Asian point of view? 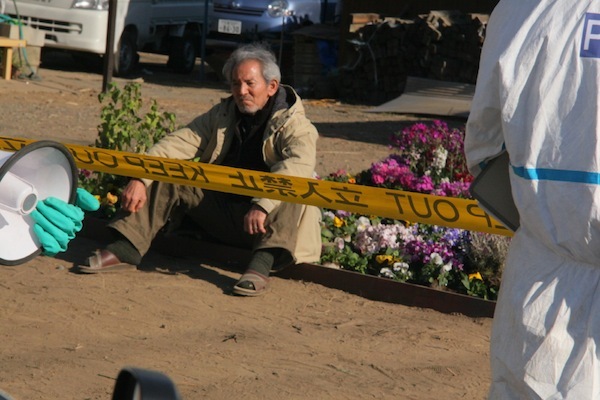 Sion Sono: I don't know anything about Korean nuclear power policies, so I’ll talk about Japan's nuclear power. Even though the Japanese government promised it would be nuclear power free by 2030, we don’t believe it. This is from hearing these types of promises many times before. Right now, a lot of Japanese people don't trust the Japanese government. The situation is a lot like in my movie. People think they have to do something by themselves, like in the movie. As an example of this in Japan, you'll see regular Japanese people carrying out quiet demonstrations every Friday by the Prime Minister's residence. Audience Question: The name of the safe city that the son and wife go to towards the end of the film is never specified. I want to know if you didn't specify the name because the city doesn't exist, the city exists everywhere or some other reason? 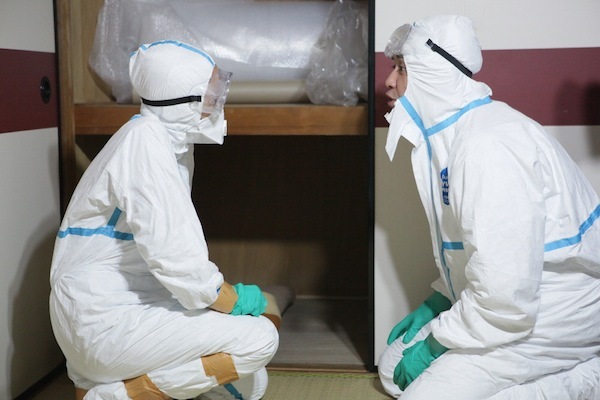 Sion Sono: When the nuclear power plant had its meltdown in Fukushima, radiation flew to Tokyo, where I live. We are in the same predicament today. If something like that happens again, I think there is nowhere in Japan you can go. The scene is a warning that it doesn't matter where you go. Audience Question: In the movie, people are told to walk one step by one step. Why is that? Sion Sono: After Japan's defeat in World War II, our country carried out industrialization at a rapid pace, without weighting the consequences. Japan basically sprinted for economic growth. During this time, we didn't have a chance to examine whether nuclear power is safe or not. As a result, we are in this kind of situation. This year, the Japanese government started the nuclear power plant earlier than expected. I think if Japan keeps the pace of its recent past it can't avoid failing. My point with the characters walking one step by one step is my wish for the Japanese people to go forward slowly .... one step by one step. Moderator: What happened to the two ghosts? Sion Sono: You referred to them as ghosts, but they are two kids in the movie. These two kids can be grownups who were swept away by the tsunami and became kids or a special type of existence, like spirits or something from heaven. Audience Question: I watched a lot of your movies. You seem to cast some of the same actors and actresses in your films. Is this because of your relationships with them? Also, I think stylistically "The Land of Hope" is quite a departure from your prior film "Himizu." What is your future plans? Sion Sono: Thank you for watching my films. Since March 11, 2011, I think I can make 2 types of movies. One is a movie focused on entertainment. 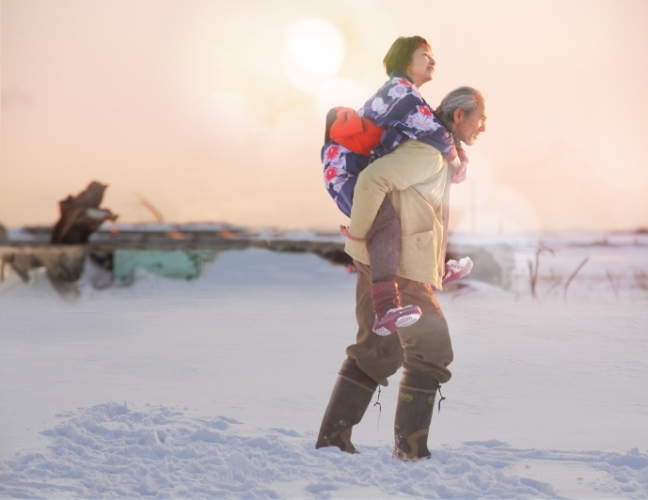 The other is a movie depicting social problems, especially related to Fukushima. Right before I came to Busan, I just finished my next film, which is a total comedy. 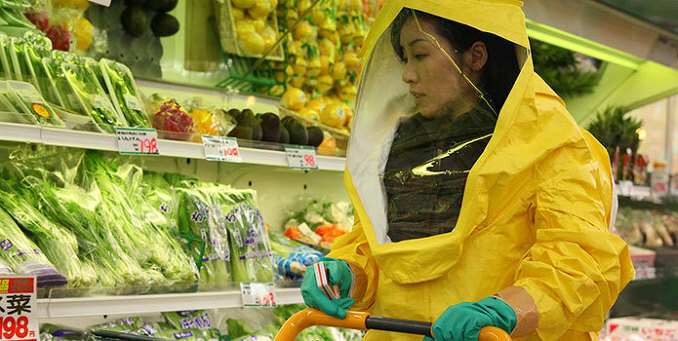 The movie I just finished has nothing to do with the Fukushima Daiichi nuclear disaster or any other social issues. Going forward, I think I will make two totally different kinds of films at the same time. Audience Question: This might be a trivial question. There is a song about a mole digging in the ground. Did you put that song in the movie and, if so, did you do it thinking of your prior film "Himizu" (literally "Mole")? 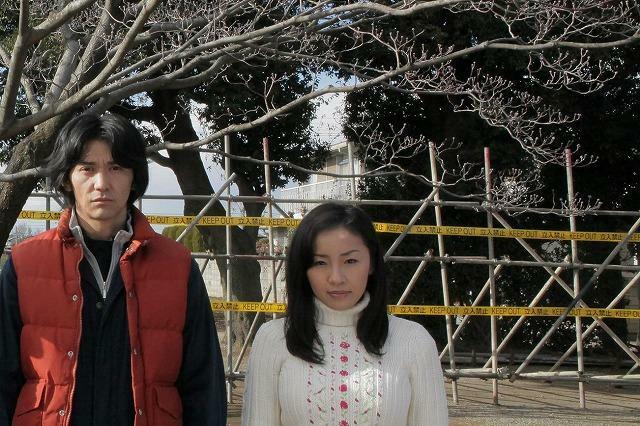 Sion Sono: The song you are talking about has lyrics about digging, digging and digging. That's a song for miners and not moles, so the song doesn't have anything to do with "Himizu." Coal used to be a main energy resource before nuclear power. 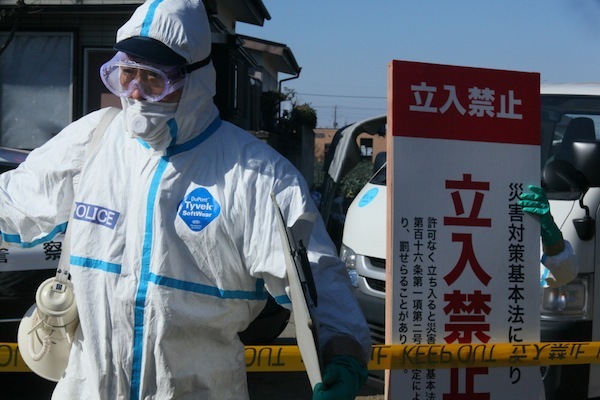 Rural areas like Fukushima became a power source for big cities. I put the song there to describe that, but it doesn't have any deeper meaning. Audience Question: When the two kids disappear, Yoko keeps calling for them and crying. Is there something more in why Yoko repeatedly calls for them? Sion Sono: You mean "Eoi". Because of the tsunami, a lot of people lost their lives. I think that "Eoi" is a sound calling for spirits who died from the tsunami. What I mean is that Yoko lost her mom and dad in the tsunami. She might call out not only for her parents, but also other people who lost their lives in the tsunami. The kids who disappeared might be the ones that somebody else is looking for. I think "Eoi" is a cry, which talks to them and calls their names. Audience Question: There are several scenes in which the elderly father stands in the garden against a natural backlight. That impressed me. Did you time the filming around the same time of day to get that kind of lighting? Sion Sono: Movie is very strange. I don't know how the father stood during the same time of day on separate shootings. That kind of thing just happened and I didn't do it intentionally. Before making the movie, I went out and did research for my film. The main family in the movie is drawn from a real family. When I went to the family's home for research, I found a boundary line in the garden. Around the boundary line, one side is a ghost town and the other is normal. Also, a tree is in the garden and the family raises a dog. Moderator: I am impressed with the old man's character the most. 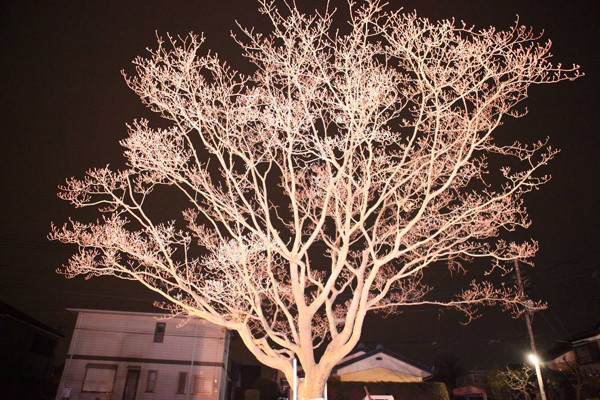 He has an image similar to the tree in his yard. Is that a coincidence or intentional? 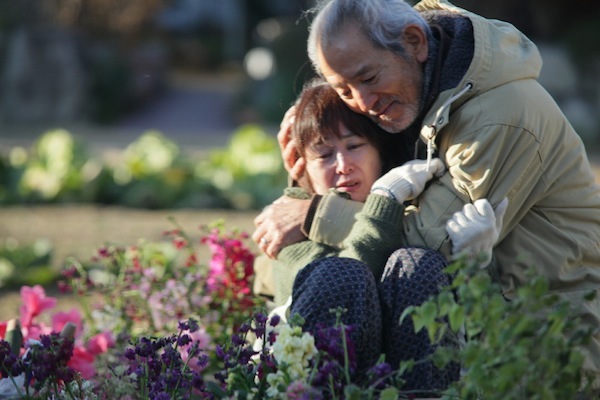 Sion Sono: I wanted the old man to have a farmer's image, which is rooted in the ground. 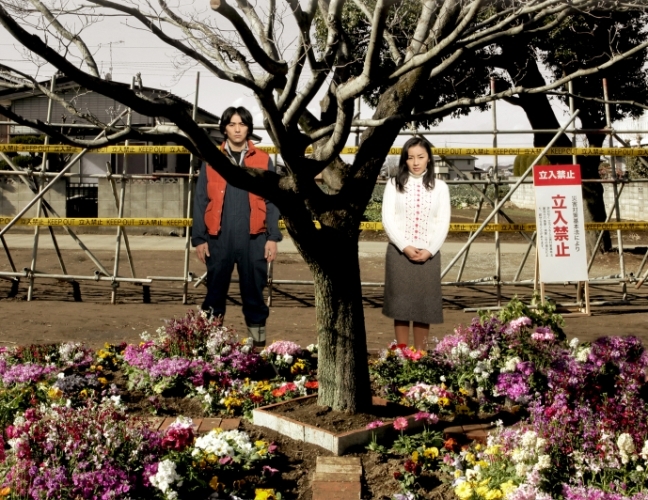 The tree in the garden is one of the most important images in the film. I didn't want to show that too obviously, but that remained in my mind all the time during the filming. Pippa Aug 18 2015 5:33 am 'The Land of Hope' is miles better than Sion´s 'Himizu', which tried and failed to deliever a similar hopelessness and tragedy. Chiro-kun Jul 29 2012 11:01 am Yay, more Shion Sono! @Soo Mab Is your name pronounced Shou-Mo-Bho? Richard Rocco Hele Jun 25 2012 8:07 am Can't wait to see that!